During a severe accident hydrogen is produced and released to the containment. This light gas can accumulate at higher elevations and form flammable mixtures. A subsequent combustion process, as observed e.g. during the Fukushima accident, can lead to significant damage to the containment structures. Today, CFD is used more widely in order to predict the transport and mixing of hydrogen inside 3-D multi-compartment geometries. 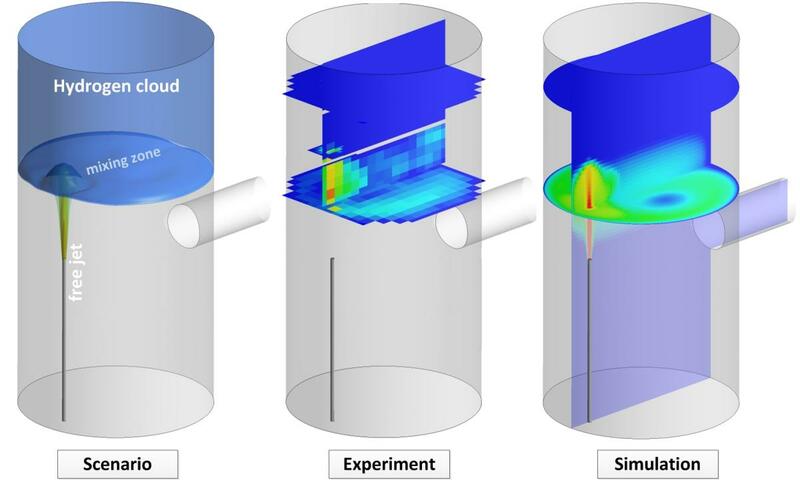 While CFD itself is well known from other industrial applications the underlying models cannot be transferred to the present buoyancy affected flows without comprehensive validation. In the frame of this benchmark activity, German, European and international partners (e.g. USA or Russian Federation) investigate the turbulent mixing of a hydrogen accumulation due to a vertical free jet. The main aim is to test the predictive capabilities of the codes and to improve the reliability of the applied modeling approaches. The experimental basis is the well-instrumented small-scale test facility MiniPanda (V~3m^3;) operated at the Swiss Federal Institute of Technology in Zurich (ETHZ). MiniPanda offers a dense instrumentation with a high spatial and time resolution and well defined initial and boundary conditions. The facility is well suitable for CFD model development and validation, in particular due to its temperature wire mesh sensors (TWMS) which allow to measure and visualize the interaction of a free jet (hot air) with a cold helium layer (substitute for hydrogen ) and provide field data for the comparison with the CFD results. The access to the benchmark data is password protected.